Patricia came to the Foundation in 2003 from Stanford University where she held several roles within the human resources organization including human resources officer for various university departments, among them: human resources, information technology, finance, sponsored research, and the Stanford Management Company. By the time she left, she was a senior analyst with the compensation team. 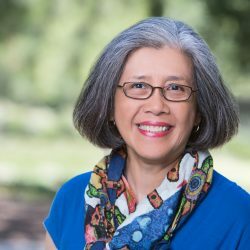 Patricia has a degree in anthropology from the University of the Philippines and did fieldwork on nativistic communities in the Tagalog-speaking region of the Philippines. She completed her coursework for the Masters in Liberal Arts program at Stanford University and the Human Resources Executive Program at Stanford’s Graduate School of Business. Patricia is certified by the Society of Human Resources Management as a Senior Professional in Human Resources and by the WorldatWork Society of Certified Professionals as a compensation professional.